Today, no. 61 Chelmsford High Street is occupied by Paperchase. 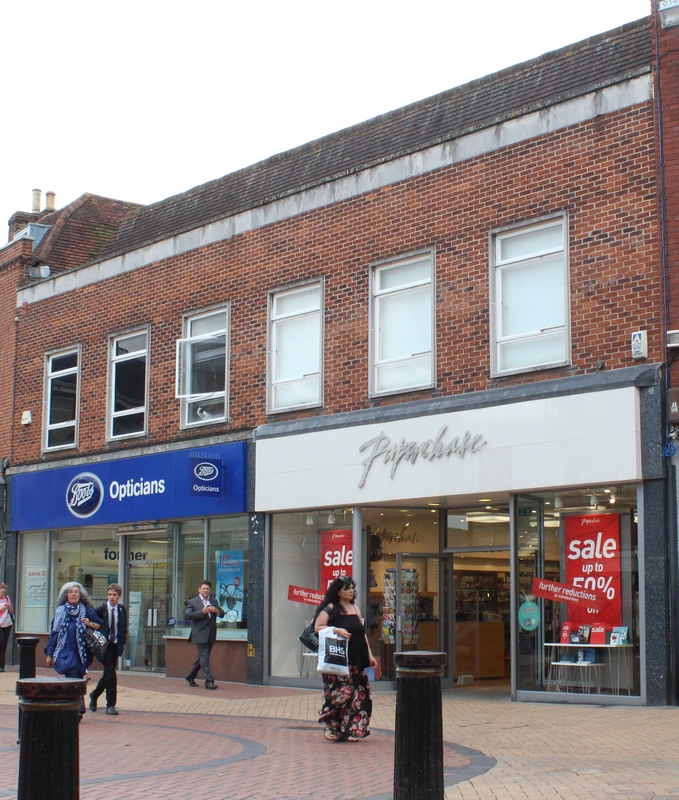 In the eighth post in our series looking at the history of Chelmsford High Street, Ashleigh Hudson looks at what else has stood on the site through the centuries. Find out more about the Chelmsford Then and Now project here. In the 16th century, the site of 61 High Street formed part of two tenements known as Cocksayes and Patchings. By 1618, the site was divided into three distinct properties. The central property (61) was occupied by the Ship Inn, later known as the Waggon and Horse. The inn was ideally situated opposite Springfield road, in the heart of the High Street. From 1798 the inn was known as the Queen’s Head which was described as a ‘good accustomed public house now in full trade’ in 1807. The Sales Particulars reveal a large property, with considerable facilities for entertaining including a bar, a large parlour and a market room. One of Spalding’s earliest photographs of the High Street c.1869. The Queen’s Head can be seen on the left. The Queen’s Head continued to provide visitors with modest accommodation throughout the 18th and 19th century and the inn benefited from a steady flow of trade. Watercolour of the Queen’s Head Yard by A.B. Bamford in 1906. Neild was unfortunately referring to the Queen’s Head. One can imagine the visitors staying at the Queen’s Head did not enjoy a room with a view, thanks to the ‘hog-stye’ and prison yard located to the rear of the property. By the 20th century, inns and public houses were slowly disappearing from the high street as the demand for retail increased. The Queen’s Head managed to survive until the 1970s when it was demolished. A quick comparison of the Ordance Survey (OS) map of 1963 and the OS map of 1974 reveals that a substantial section of the west side of the high street was completely redeveloped. The Queen’s Head is identifiable on the 1963 map by the ‘PH’ initials, which stands for public house. The property has quite a distinctive, backwards ‘L’ shape and a narrow passageway is visible, sandwiched between the Queen’s Head and the site of 62 High Street. The OS map from 1974 reveals a very different property on the site of 61 High Street. The shape of the building has completely changed and the narrow passageway has been consolidated to form part of the new building. Entry to the yard can only be obtained via the rear of the property. These maps illustrate how the town was transforming in the 20th century; based on these maps, one would imagine that the west side of the high street is virtually unrecognisable to those who remember the high street as it looked in the 1960s. Current image of Paperchase, occupying the former site of the Queen’s Head. Today nothing remains of the original Queen’s Head building and the site of 61 High Street is currently occupied by Paperchase. If you would like to find out more about the Queen’s Head see Hilda Grieve’s detailed history of Chelmsford The Sleepers and The Shadows. Alternatively, try searching the Queen’s Head in Essex Archives Online. The Essex Record Office possess a fantastic range of OS maps which are available for viewing in the Searchroom.